Midfielder Jack Cork does not think the delay in appointing a new manager has had any effect on Swansea City's form. Swansea have picked up five points in the four games Alan Curtis has been in temporary charge since Garry Monk's departure. Curtis will remain in charge as the club search for a new manager and Cork is pleased with the team's results despite the uncertainty. "You can see from the results at the minute it's not affecting us," he said. "We've got a few good results this Christmas period and we can kick on. "Three games without a loss is a good start. Hopefully we've turned a corner." 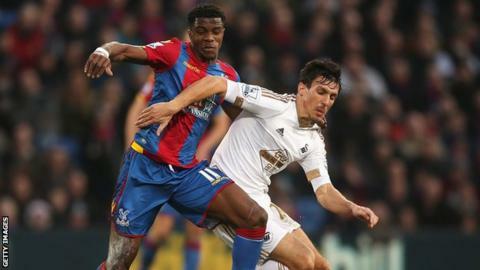 Swansea extended their unbeaten run to three games with goalless draw at Crystal Palace. That came two days after their 1-0 win over West Brom on Boxing Day, only their second victory in 14 Premier League matches. The Swans travel to Manchester United on Sunday, 2 January to face a side they beat 2-1 at Liberty Stadium in August. They did the double over Louis van Gaal's side in the 2014-15 season and Cork says the trip Swansea will not be daunted by their trip to Old Trafford. "We'll go there with no fear and wanting to win the game," Cork added.